When I first heard that Carrie Fisher had written a novel several years ago, it seemed like an absurd one-off, like Don Johnson’s album with Barbra Streisand, or a line of Kathy Ireland sportswear. But Fisher, as it turns out, could turn quite a phrase. And in light of all the recent The Force Awakens/Rogue One rejuvenation (in some form, Fisher appears in both), Fisher’s true writing talent is in danger of getting lost in the Death Star shuffle. Fisher is being described across social media as a woman “who gave no fucks” as she gleefully poked fun at the movie that made her famous at 19, while chiding those who despaired that she had aged in the almost four decades since Star Wars premiered. But she long had (the past tense is paining me here) a musical gift for rearranging familiar words and phrases into something else entirely: She was funny and sharp and witty even as she was laying her soul wide open. 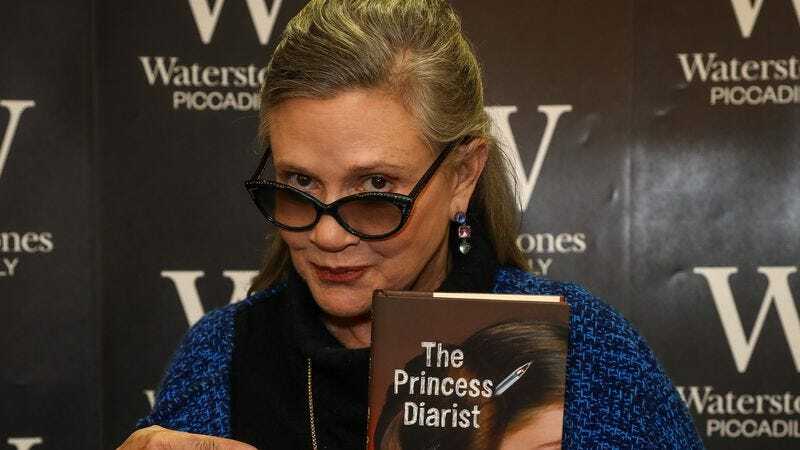 That same candor Carrie Fisher displayed in those recent talk shows and Comic-Con panels, she’d been pouring all over the page as long ago as 1987, when her first novel was published. Maybe I shouldn’t have given the guy who pumped my stomach my phone number, but who cares?… He probably won’t call, anyway. No one will ever call me again. The cocaine people sleep all the time because by the time they get here, they haven’t slept in weeks. We opiates have been sleeping a lot, so now we roam the halls at night, twitching through our withdrawals. I think there should be ball teams: The Opiates vs. the Amphetamines. The Opiates scratch and do hand signals and nod out, and the Amphetamines run around the bases and scream. There are no rules to this game, but there are plenty of players. The novel eventually switches to the viewpoint of Alex, a Hollywood heavy-hitter who winds up in the same clinic as Suzanne after overdosing on heroin in Brentwood, then to a detached third-person for Suzanne as she navigates Hollywood life as a former drug addict. Some banter shows up in the cinematic version of the book (He: “I don’t like this side of you.” She: “I’m not a box. I don’t have sides. This is it. One side fits all.”), but not much else carries over into the film. For Postcards From The Edge, Fisher used her novel as a basis for her screenplay, but extrapolated to include a central conflict between Suzanne (Meryl Streep) and her movie-star mother, played by Shirley MacLaine. It’s worth noting that all of Fisher’s novels feature her viewpoint as a Hollywood insider (as she put it, she grew up street smart, but the street was Rodeo Drive). Her revision of Postcards as a screenplay offers some valuable behind-the-scenes moments of the life of a film actor: the tininess of the on-set trailer, a post-set looping session, walking through a backlot as the scenery changes rapidly. In Fisher’s novels, you can scratch the surface of various characters to find Fisher’s real-life celebrity friends listed in the acknowledgments: Suzanne’s friend Lucy is likely Beverly D’Angelo (even her twins by Al Pacino apparently show up in Postcards’ 2004 sequel, The Best Awful There Is). Perfect friend Joan resembles Meryl Streep, and for Suzanne’s helpful friend Craig, I always picture Craig Bierko, who Fisher calls in the acknowledgements, “My higher self, but only in terms of height.” From the time Fisher was born, as the daughter of famous couple Debbie Reynolds and Eddie Fisher, she never knew what it was like to be outside the spotlight, making the difficulties of dealing with her mental illness all the more acute. In Postcards, she focuses mainly on Suzanne’s life in rehab and after it. In the novel, Suzanne’s mother is much more benign than in the movie, bringing a velvet and satin quilt to the rehab (Suzanne quips, “I don’t know how I detoxed without it.”) Still, Fisher foreshadows the mental illness that would return in full force in The Best Awful. Suzanne takes to her bed for awhile, flipping through TV channels the way someone else might scroll through a scrapbook, as every cable show seems to feature someone she once dated. She eventually rights herself, stays off drugs, and dates someone she meets in a talk-show green room. But it’s the short asides that Fisher liberally pours into every page of her debut that makes it such a compelling read. At the clinic, she summarizes that all the activities can be boiled down to one thing: “You simply don’t do drugs, That’s all we’re doing here: Not Drugs.” When Suzanne says that “Instant gratification takes too long,” Fisher is aligning herself with a hedonist like Oscar Wilde, who boasted that he could resist everything except temptation. “And periods and twenty-three percent more body fat,” said Dinah. “Sure, to make up for menopause,” said Lindsay, pushing one side of her smooth curtain of hair behind one ear. “And how many women do you know who have had multiple orgasms?” Dinah added to Roy. “Without a machine?” said Lindsay, laughing. “Yeah,” laughed Dinah, looking affectionately at Lindsay, her eyes shining. The baby tide had come in, leaving her barren beach of a body strewn with one perfect baby shell. Cora put her ear to it and heard her whole life roar. Of all four novels, the most effectively personal one—and the most emotionally grueling to read—arrived in 2004, with The Best Awful There Is. Fisher returns to the story of Suzanne Vale, who relapses. In real life, Fisher revealed that she had bipolar disorder; her attempts to self-medicate with drugs led to another rehab stint in 1998. But in The Best Awful she specifically crafts how something like that would have played out, and results are as harrowing as they are riveting. The baby in Delusions is now 5-year-old Honey, and Suzanne’s ex, Leland, left her for Simon (termed “the man that got the man who got away” in the book). Fisher’s real-life partner, Bryan Lourd, father of her daughter, Billie Lourd, also came out as gay after their relationship ended. So Suzanne is a single mother on medication trying to craft her life when she falls off the wagon for the first time in years. This descent culminates with a terrifying trip into Tijuana: Suzanne describes it as traveling to the “Oxycontinent,” and brags about faking dental problems to get access to painkillers. There, she is abandoned after getting beat up by the guy who drove her down there, having spent all her money on drugs, her child still at home with her ex. Suzanne is rescued by a friend and then finally calls her doctor who puts her on a strong medication that almost kills her, and she’s back in the hospital. We can read Fisher’s quotes about her struggles with mental illness, but The Best Awful bravely depicted just how terrifying those day-to-day battles of trying to balance medication with sanity must have been. Most heartbreaking is Suzanne trying to explain her illness to young Honey: She describes it as a faucet that either goes too fast or too slow. Suzanne laughed a laugh with a hiccup of a sob in it. In fact, that’s what I keep going back to when I think about Fisher and the outpouring of work she managed over the years, not just these four novels, but the memoirs that followed, alongside a variety of acting roles and script assignments. She was not only amazingly productive, she managed all of this while battling a mental illness. Lesser mortals may have curled up and accepted defeat, instead of translating the “mess in my head,” as she described it, into several volumes and movie scripts. My favorite piece of Fisher’s may be her Wishful Drinking HBO special, which combines her virtues as a writer and a performer. She translates her parents’ uncoupling for her younger audience by putting it Jennifer Aniston-Brad Pitt-Angelina Jolie terms. (Elizabeth Taylor is Angelina in this scenario; all the women involved eventually buried the proverbial hatchet with Fisher’s script for the 2001 TV movie These Old Broads, which featured Reynolds, Taylor, MacLaine, and Joan Collins.) Fisher boasts of being the only person in the world to have their own Pez dispenser and be listed in an abnormal psychology textbook, accompanied by a Princess Leia picture, no less. Like many artists, Fisher’s mental state only spurred her considerable creative output; I’m only sorry that her words didn’t seem to have more of an impact, because she deserves to be listed right alongside Wilde and Dorothy Parker herself. Maybe it’s the secrecy of some of that script doctoring: I wasn’t surprised to learn that she worked on The Wedding Singer, for example, as it’s about the only Adam Sandler movie I actually like. Every tribute I spy of hers with her in that gold bikini makes me cringe, but we can take solace in the fact that, as of today, her memoirs are all sold out on Amazon, meaning that her brilliant, funny words are now reaching even more people. Because, after all, nothing is ever really over. Just over there.